Llewyn Davis is struggling. He is trying to make it as a folk musician in 1960s New York but just can’t seem to catch a break. Homeless, broke and virtually friendless (unless you count the ginger cat that crosses his path) Llewyn finds himself at a crossroads. Should he continue to pound the streets, singing in any club that will give him a chance? Or should he admit defeat and give up his dream? I knew that I was going to enjoy the Coen Brothers’ Inside Llewyn Davis from the very first few seconds. The film begins not with images but with the sounds of a busy club - the rumble of voices and the clinking of cutlery. Then, a close up shot of a microphone and we hear a guitar. Oscar Issac appears and starts to sing a beautiful, haunting song. In so doing, he sets the scene for the rest of the film. For these first frames tell you all you need to know about Inside Llewyn Davis - that it will be muted (both in tone and in colour), melancholic and that it will be infused with some brilliant, original music. What those first scenes don’t reveal, however, is the truth inside Llewyn Davis. That (despite the film’s title) remains elusive. What we do soon realise is that Llewyn is not a particularly likeable character. He is selfish. While he relies on the mercy and generosity of everyone he meets, he feels no compassion or respect towards his benefactors. Llewyn hurts people - what else could explain his friend Jean (Carey Mulligan)'s openly hostile attitude towards him? Despite this, we do care about Llewyn. His life seems so hard with so little reward and we want at least something to go right for him. Oscar Issac is superb in Inside Llewyn Davis. This film really allows him to show off all of his remarkable talents - both as an actor and as a musician. While Issac dominates the film, Inside Llewyn Davis also features a strong supporting cast. Well, this is a Coen Brothers movie after all. Carey Mulligan is startlingly brutal. She certainly pulls no punches. Meanwhile, Justin Timberlake (playing her on-screen husband, Jim) is hilariously naive. The film also features a brilliant performance from Adam Driver. I could have happily watched more of his story - but not too much more of the classic song, Please Mr Kennedy! Meanwhile, John Goodman is wonderful as Roland Turner - his fifth collaboration with the Coens. Turner, like many of the intriguing characters in this film, is suddenly there and then, just as quickly, gone. Many of these supporting roles (and, of course, Isaac’s performance) are darkly funny. All, along with the movie’s colour palette of greys and browns - contribute to this film’s melancholic atmosphere. Inside Llewyn Davis is also a film about a particular time in music history. The time before folk music hit New York’s Greenwich Village - when no one was interested in singers like Llewyn. The time just before Bob Dylan arrived and everything changed. There is much poignancy in knowing what we know now - what Llewyn doesn’t, couldn’t realise. Inside Llewyn Davis leaves us to wonder if, despite his talent, Llewyn is a man out of time - so close to greatness and yet so far. Inside Llewyn Davis is the Coen Brothers’ fourth collaboration with award winning music producer, T Bone Burnett. The movie's soundtrack is pretty awesome. There are many theories regarding the relevance of the cat in this movie. 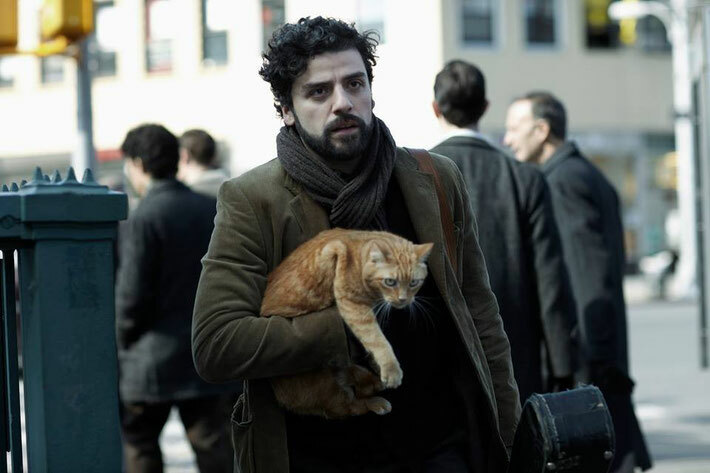 Is the cat actually Llewyn? I have watched a number of superb Oscar Isaac performances recently... including The Two Faces Of January, A Violent Year, Ex Machina and, of course, as Poe Dameron in Star Wars: The Force Awakens. 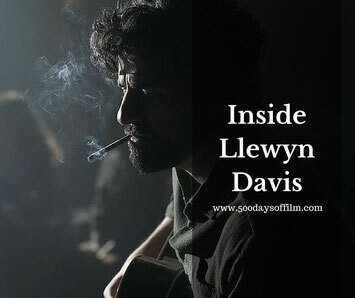 Have you seen Inside Llewyn Davis? If so, what did you think of this movie? Don’t forget to let me know by leaving me a comment in the box below!